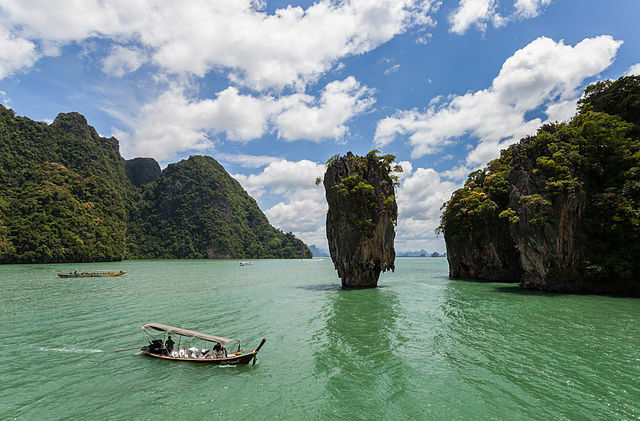 Most visitors are intent on viewing Phang-Nga Bay’s bizarre landscape, which includes more than 120 singularly strange looking islands. Therer are many places where boats can be rented to travel Phang-Nga Bay: Tha Dan Sullakakorn Pier (Customs Pier): near Phang-Nga Bay Resort. Boats from small to large including ones suitable for group tours can be rented. Surakoon (or Ka Sohm) Pier : lies in Takua Thung. Here you will find long-tail boats seating about 6 persons each. The pier in the area of National Park: has long-tails holding up to eight persons each. 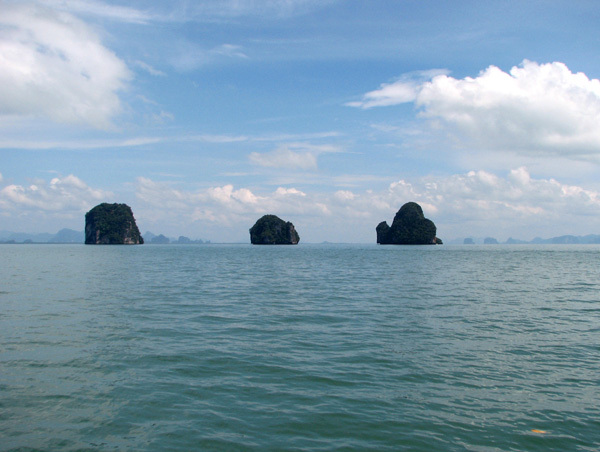 It takes about three hours to view Phang-Nga Bay. The best season is from December to April, but because of the calm seas that prevail year round in this waveless body of water, trips to Phang-Nga are an on-going activity. Many companies in Phuket offer sight-seeing tours, and various modes of travel are possible: from long-tail boats, to sea canoes, to Chinese junks. Virtually all of them include lunch in the price of the tour. Check with your travel agent for details. Those wishing to explore on their own can charter a boat Check the rental fee listed on the signboard at the pier. Places of interest within the Ao Phang-Nga National Park include : Ko Panyee: This small island has a picturesque village, which rests precariously on small pilings and extends out across the water. It is inhabited chiefly by Muslim fisher folk, whose unique culture has existed, cut off from the mainland and most modern amenities, for more than a hundred years. Souvenir shops and seafood restaurants cater to visitors. Khao Ping-Gan: The name means literally leaning mount. It is really a huge rock split in two; the smaller half has slid down and the remaining one appears now to be leaning. 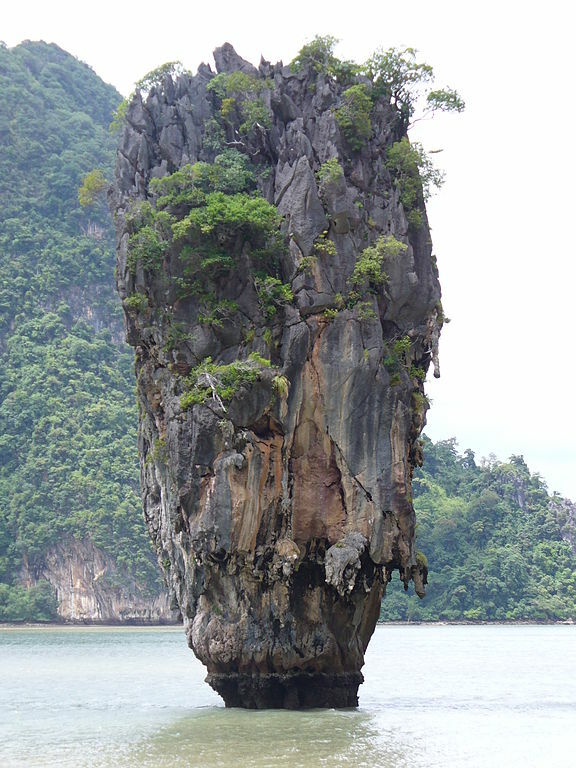 Though Kao Ping-gan is a very small island, Khao Tapoo or James Bond Island, is in a little bay of Khao Ping-Gan where visiting boats pull up. Tapoo means nail, and this shoreless rock projects up from the sea as its name implies flat and wide at the top, and very narrow at waterline. It is a striking sight. And the island became more famous after the James Bond adventure, The Man with the Golden Gun, was partly filmed here. Tham Lod Grotto: This cave in Takua thung has beautiful stalagmites and stalactites. The long tail boat can go through another side of the cave. Hong: Hong means room, and entering this hollowed out island by boat is much like floating through a giant reception hall with two doors. Panak Island: A cave with stagmites and stalactites, where a small stepped waterfall fo regular descent adds to the beauty, is the island’s salient feature. Khao Khien: The islet of writings is what the name means. Indeed, there are ancient depictions of animals and boats which the Fine Arts Dept. has dated back no less than 3,000 years. Low on the mountain walls just above the tideline of this shoreless island, they were presumably drawn by voyagers long ago who took refuge there during storms. The island lies on the way to Ko Panyee. Also of interest in Phang-Nga Bay National Park are the mangrove forests and swamps, cut by twisting channels, that line the mainland shores. Ko Yao consists of two large islands, Ko Yao Noi and Ko Yao Yai, surrounded by many smaller islands. The total area is 137.6 sq. kms. 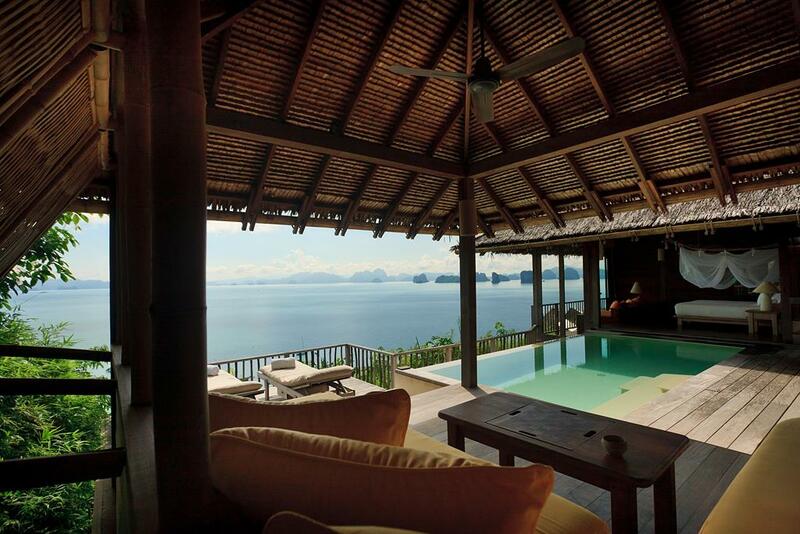 Largely unaffected by booming developmet in nearby Phuket, Ko Yao retains its traditional Muslim culture. 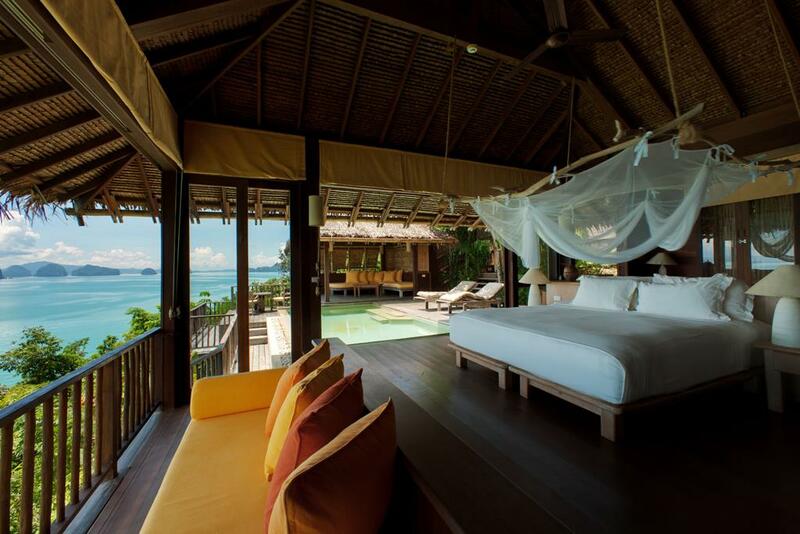 There are a few bungalow operations providing basic but very charming accommodations. Rental vehicles are not an option, although sometimes you can strike a deal with people at the bungalow to use their motorcycle. 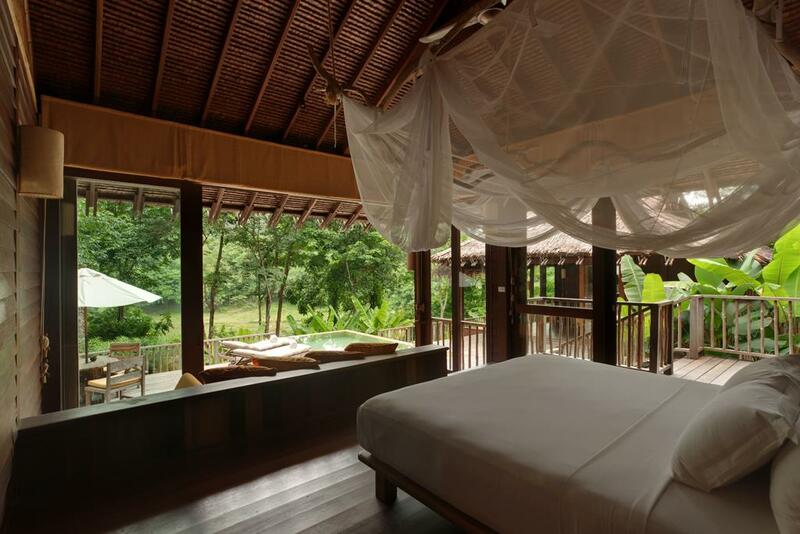 Traveling to Ko Yao Yai is like traveling back in time. On Ko Yao Yai there are many interesting beaches Tikood Bay is a bay with a white sandy beach. On the north is a rocky point from which a very beautiful panorama can be seen. The shore is shaded by a line of casuarina trees. : Ao khlong Son has a white sandy beach shaded by evergreens, with variously coloured sea rocks and small boulders. In this bay you can swim, look at lovely corals during low tide, or search for shellfish. Ao Sai A beach with fine white sands and beautiful sea rocks. Good for swimming. Ao Larn is a lovely beach. Swimming is good. On the north is a headland of steep cliffs. Watch out for deep water. Travel to Ao larn is easier by boat than overland. Ao Hin Gong:Â The beach is shaded by a forest of Mai Kiem (Cotylelobium Lanceolatum), which are long, straight trees. Rays and skates abound in the waters. Not suitable for swimming. Lo Pa Raed is a beach with fine white sands shaded along its length by a coconut plantation. A rocky cape is at the north end. Swimming is safe at Lo Pa Raed anytime. Laem Nok-ok:Â A beach of many coloured rocks; good swimming anytime. On Ko Yao Noi, there are same picturesque beaches; Hat Pasai lies about 7 kms. from Ko Yao Noi’s District Office (referred to as the amphoe). It is a white sandy beach shaded by a line of trees where swimming is safe. 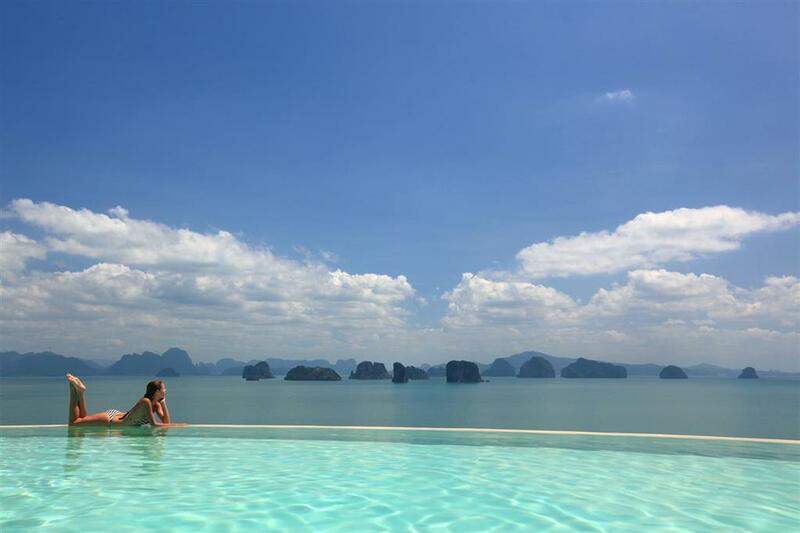 The islands in the distance off Krabi form a panorama in the distance. Hat Tha Khao is approximately 5 kms. from Ko Yao Noi’s District Office. Intricately lined, colourful rocks both large and small are the attraction of this beach. Just offshore is Ko Nok, a tiny island that can be conveniently reached on foot at low tide. It is covered by very interesting wild plants and orchids. Travel to KoYao:Â Boat leave for Ko Yao from Phuket, Phang-Nga and Krabi, but leaving from Phuket is the most convenient. Leave from Bang Rong Pier in Tambon Pa Khlok on Phuket’s northeast shore to go to Ko Yao Noi. Passenger boats leave in the morning and charge 40 baht per person (one way). Long-tail boats can be chartered for 600-1,200 baht each way. The trip takes about 1 hour. Speed boats to Ko Yao Noi are 4,000-6,000 baht For Ko Yao Yai, boat leaves from Tien Sin Pier at 10.00 a.m. and 2.00 p.m. It takes about 1 hour and the fare is 50 baht per person (one way). . Travel between Ko Yao Noi and Ko Yao Yai is 20 baht. Boats leave from Ko Yao Noi’s Manoh Pier and take 15 minutes to cross the channel.